Hello everyone. Hope you had a lovely weekend. I am starting sneak peeks from Taylored Expressions Feburary New Release. This is day #1 of the sneak peek. 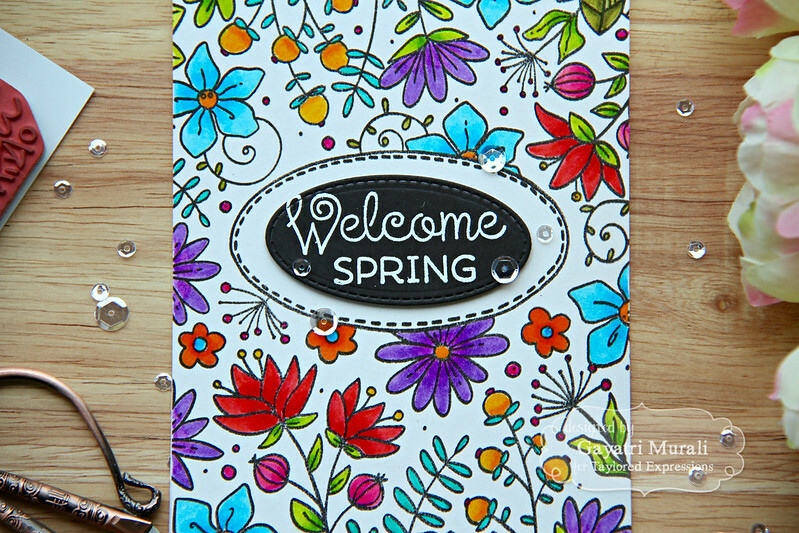 This release is amazing with plenty of spring and easter themed stamp set and dies. You may want to make a wishlist as you see the sneak peeks for the next four days. Otherwise you will want to hit the “I Want It All” button Lol! Its that good of a release. Today I am showcasing four products. The first one is a beautiful background stamp called Bloomin’ Background. This is a gorgeous floral background stamp with a space for sentiment framed with stitched detailed oval. The images are outline images. So you can colour them with whatever medium you like. Absolutely beautiful don’t you think? I combined this stamp with another new stamp set called Simply Said Spring to make my card today. The inspiration for the colours for my card came from the photo of the background stamp. 2. The Bloomin’ background stamp is stamped on Bristol smooth cardstock panel cut to the size of the card front. I used TE’s Oreo hybrid ink and MISTI to stamp twice to get an even coverage of the stamped image. 3. I coloured the image using Zig clean colour brush pens. I used two shades of colour to get some shading into the colouring. 4. For the sentiment, I die cut a oval using Oreo cardstock and white heat embossed the sentiment from Simply Said Spring stamp set. 5. I simply adhered the sentiment panel on the centre of the stitched oval on the coloured panel using foam adhesive. 6. The panel is adhered to the card front and embellished with sequins. The next two products I am showcasing are Rainboot Bouquet stamp set and Rainboot Bouquet die. This is such a cute stamp set and I had fun colouring the rainboot image. On this card I have also used the new Lattice Frame Cutting Plate. 1. Card base is made using Sugar Cube cardstock. 2. I have used the pink polka dot pattern paper from Hello Happiness pattern paper pack on the card front. 3. I die cut the Lattice Frame cutting plate using gold mirror cardstock and adhered on the card front. 4. I used the second largest oval die from Lattice Frame cutting plate to die cut using TE vellum paper and the third largest oval die to die cut using gold mirror cardstock to layer on top of vellum die cut using foam adhesives. I adhered this layer flush on the centre of the card front. 5. 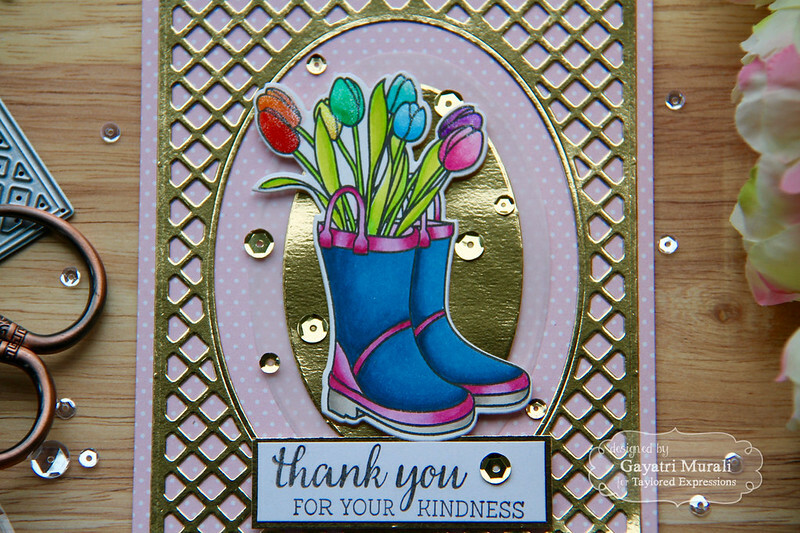 The Rainboot Bouquet image is stamped using Oreo hybrid ink and copic coloured. Then I die cut the image using the coordinating die and adhered on the centre of the layered oval diecuts using foam adhesives. 6. Sentiment is gold heat the sentiment from Rainboot Bouquet stamp set on a piece of Sugar Cube cardstock, matted with gold mirror cardstock and adhered using foam adhesives. 7. Finally I embellished the card with gold sequins and brushed the tulips with clear Wink of Stella shimmer pen. Here are some more photos of the card. While you are there, check out gorgeous inspirations from the rest of the designers using the sneak peek products. See you tomorrow with more TE sneak peek. These are just gorgeous Gayatri! I love your coloring on the Bloomin' Background and that gold foil is amazing!! Love the cards the bloomin background is my favorite so far. Gayatri, I love all the little details that you added to each of your cards. Your coloring on the Bloomin' Background stamp is fantastic! Thank you for the inspiration.